When you listen to the news long enough, you’ll find a recurring theme at the base of many major news stories: the environment versus the economy. You can find these opposing ideas in stories impacting regions as large as the nation, all the way down to our own city streets (google “TransCanada pipeline”, or “4th Street long-eared bats in Duluth”). The MIC, however, does put these two opposing views together in a room at least four times a year at the Harbor Technical Advisory Committee (HTAC) meetings. As one of the MIC’s three advisory committees, the stakeholders of the harbor are brought together for presentations and discussions with other stakeholders of the harbor. The 31 voting members of the HTAC include business owners, environmental groups, and local and state federal officials. Non-voting stakeholders are also invited to meeting to participate. During my internship I attended two HTAC meetings and have also been helping out with tasks from the Port Land Use Plan. Topics at the HTAC meetings encompass both the environment and the economy and demonstrate how they are not mutually exclusive. At these meetings we heard about what the regulatory agencies in the area are doing to take the harbor off of the national Area of Concern list, followed by a summary of how the economic development of the port supports the region and connects our economy to the rest of the world. A report on research done on the economic impact of ports throughout the Great Lakes is followed by a description of the habitat restoration being done in Radio Tower Bay and a discussion on the impacts of ballast water. Beyond these quarterly meetings, the MIC staff facilitates subcommittee meetings that get into even more depth of how the decisions of each side impacts the other. 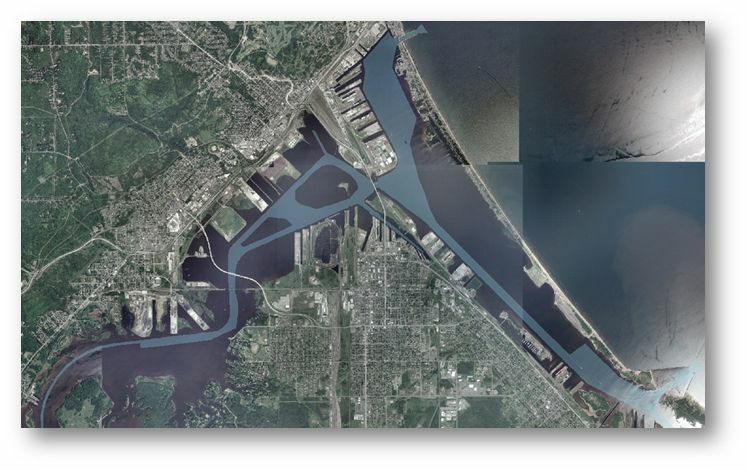 The Open Water Mitigation subcommittee, for example, creates a working group for the regulatory agencies and the investors of the port to discuss their individual goals of restoration within the St. Louis River estuary and development within the harbor. The objective of this group is for the Minnesota DNR and PCA, along with the Army Corps of Engineers, to help other entities such as the Duluth Seaway Port Authority, port businesses, and engineering and planning firms, understand how to get through the environmental permitting process for new construction. Although much of the discussion went over my head, the desire to understand each other and wanting to be better understood was palpable. 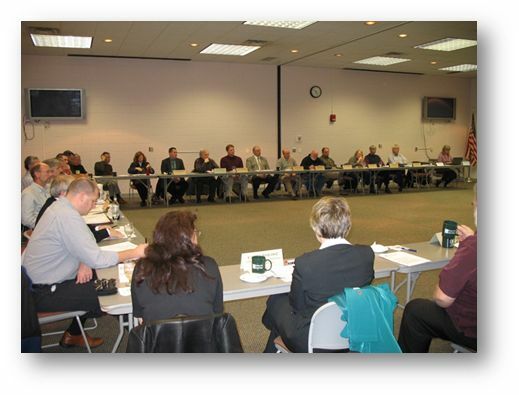 The atmosphere at both of the HTAC meetings, along with both Open Water Mitigation subcommittee meetings, amazed me. The classic ever-battling mindsets are getting together on a regular basis to understand one another and to create a better setting for growth on each side. One function I’ve come to appreciate about the MIC is that, as a neutral transportation planning organization, it is uniquely situated to support this type of coordination and collaboration. Because the MIC is tasked by federal highway legislation with a primary responsibility of creating opportunities for public participation for all modes of transportation, the MIC includes funding and staffing resources for this harbor group in its annual work program. It serves as a much-needed, often-lacking champion or sponsor to gather diverse and unrelated stakeholders together as one group. This type of collaboration is almost unheard of throughout the rest of the United States. In fact, the other ports of the Great Lakes are looking to the HTAC as a model to create this same type of collaboration between these two opposing mindsets. From what I’ve seen so far, other port communities could benefit from an HTAC-type of group if their goals include improved outreach, education, state and local level participation and grassroots support for maritime industry. Erica Hansen is finishing up her final semester at the University of Wisconsin – Superior in the Transportation and Logistics Management program. She is intrigued by looking at transportation from a different side than freight movement, and helping to create an efficient and safe transportation network for the Duluth-Superior area. The INTERNal Outsider is her account of some of her work and observations while working as an intern for the MIC.